BenQ America Corp., is launching its new "BenQ Cares" community outreach program. To kick off the campaign, the company is inviting those in need of a projector revamp, including consumers, businesses, schools, and organizations across the U.S., to enter BenQ's Colorific Projector Upgrade for a chance to win a projector makeover worth up to $5,000. The upgrade is available to LCD projector owners looking to improve the imaging experience of their space. "We're launching the BenQ Cares initiative as a way to give back to the community," said Lars Yoder, President at BenQ America Corp. "Our promise is to deliver projection solutions that are affordable and valued by our customers. BenQ Cares is a way to extend those benefits and deliver big screen projection to a broader audience." Starting now, any consumer, educational institution, or business LCD projector owner can enter the BenQ Colorific Projector Upgrade by stating the brand and model of their current LCD projector while explaining why their device is in need of an image makeover. Finalists will be selected and then one lucky recipient will win the BenQ Colorific projector upgrade worth up to $5,000. 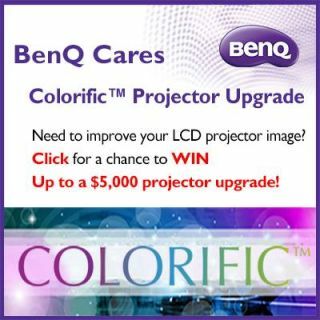 Users can enter the upgrade by visiting BenQ's Colorific website at info.BenQ.us/colorific. The deadline for submissions is April 25, and the recipient of the upgrade will be notified via email and announced on BenQ's Facebook page on May 13.